Earlier this year, our client Solar Depot won a tender to install 512Kw of solar at the SA Aquatic & Leisure Centre (SAALC) at Marion. It is one of the largest installations undertaken on a sporting infrastructure in the Southern Hemisphere. 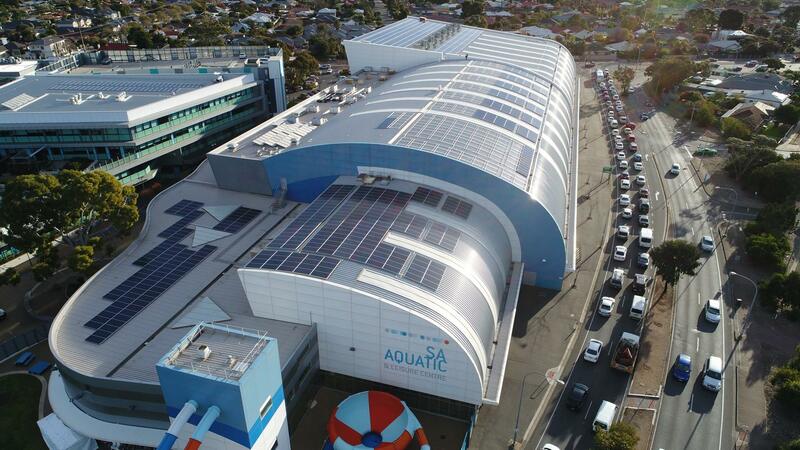 Taking over 3 months to complete, the project utilised a huge 1600 320W panels and 16 inverters, and proved to be highly challenging due to the style of roofing material and the curved sections that required additional safety measures to complete. “The project presented its challenges however Solar Depot is experienced in commercial projects of this size and complexity so we were confident in providing SAALC with the best solution. We were thrilled with the outcome and being able to contribute to such a fantastic project for the community.” said Solar Depot General Manager Scott Limbert. It is expected that the installation of the solar panels will aid SAALC’s energy efficiency and reduce its carbon footprint. Adam Luscombe, SAALC General Manager said “The installation of the SA Aquatic & Leisure Centre’s solar capacity will have tremendous benefit to the Centre. Facility investment in appropriate infrastructure and the implementation of strategies to use utilities efficiently and reduce the associated costs is key. The project was undertaken for the Centre in partnership with the Department of Planning, Transport and Infrastructure and Office for Recreation and Sport. Algo Más Marketing have recently worked with Solar Depot on projects incorporating graphic design, branding and copywriting.